Ceilidh used Plastimake to create a cute rose brooch. She made the rose bud by building it up petal by petal, it's a technique that we covered in our rose example a while ago. To create the serrated leaves, Ceilidh found that sharp scissors were effective for cutting through half-cooled Plastimake. This is a neat trick for getting crisp edges on small sheets of Plastimake. The final step was to embed a safety pin so it can be worn as a brooch. 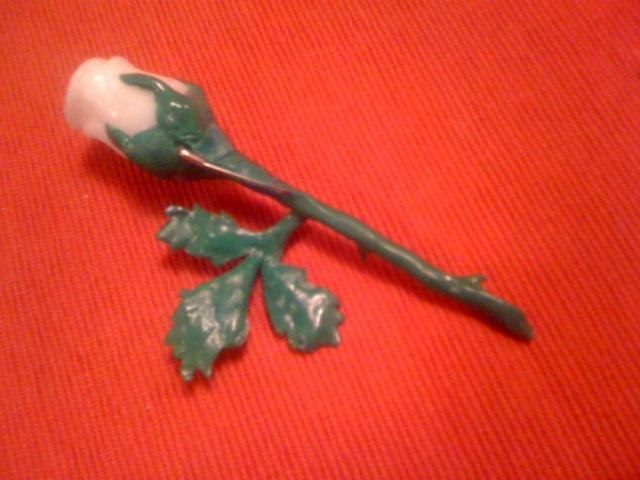 Ceilidh used another clever trick here, she heated the safety pin so it was easier to embed in the Plastimake rose stem. The result is a unique, cheap and functional piece of jewellery.